This post was inspired from the recipe here. 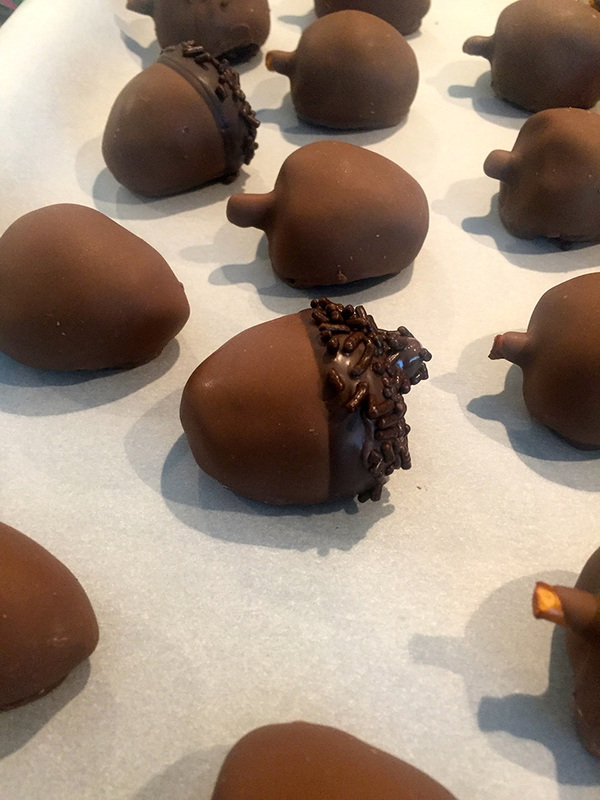 I made a few small modifications to increase the acorn appearance, but otherwise I thought the recipe was too cute not to try! Here are the items we'll be using for this recipe. Instead of using only peanut butter oreos, I mixed a box of plain oreos with 5 peanut butter oreos for a lighter taste. Aside from Reeses, I'm not a huge fan of a strong peanut butter flavor in chocolate. I worked in small bunches until I had fine crumbs. Time to mix it with the cream cheese. 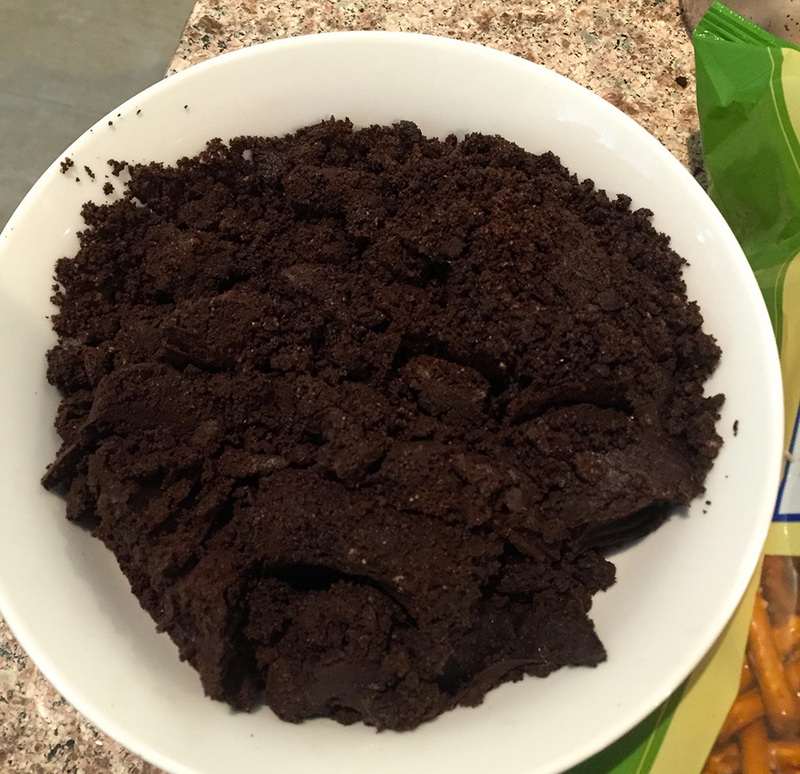 Once the Oreos and cream cheese were thoroughly mixed, I stuck the mixture into the refrigerator for a few hours to help it solidify a bit. Afterwards I took them out, scooped them into small balls, and then shaped them to look vaguely acornish. Next I took the ends of pretzel sticks and poked them into the acorns. The middles of the pretzels were properly disposed of...in mah belly. Time to do the main coating! The recipe uses the same color for both the main and top coat, but I thought it'd be cool to try and get the main coat to look a but more similar to the actual acorn color. I used the Light Cocoa Wilton candy melts and a few White Wilton candy melts for the main color. The dipping has been done! It's always so hard to get the truffle off the fork and onto the parchment paper. Overall the dipping went well aside from the 3-4 I accidentally dropped into the chocolate. Those got a bit too hot and started to lose their shape. The acorns were looking a little messy from the previous picture. I took a knife and started cutting the excess pieces off. Much cleaner now! For the darker top, I recycled the remaining Light Cocoa with Dark Cocoa and a few Black Wilton candy melts. Once dipped, I sprinkled chocolate sprinkles across the top of the chocolate. The challenge here was trying to get all the excess chocolate off the top and adding sprinkles before the chocolate topping dried. I had a few cases where excess chocolate spilled into the sprinkle pile because I moved the acorn over too quickly.